I am incredibly saddened to report that we lost Irwin earlier this week.He died in my arms about 2:30 am on Monday after suffering seizures and bloat. He became lethargic and started to shut down the previous day. He spent 24 hours in the emergency clinic getting x-rays, medication and intravenous fluids before coming home. Irwin was an incredibly sweet, playful and exquisitely cute little boy. He had a list of admirers and many people wanting to adopt him. It saddens me that he died before finding his forever home. determine the real cause of death. For learning purposes, as well as to rule out contagious diseases and protect the other rabbits in our care, we have necropsies performed on our rabbits even though it can be very emotionally challenging. In Irwin's case it is suspected that he had some sort of congenital problems,which likely led to weakness and infection in his kidneys and intestines. Irwin was a "pet store" bunny who was bought at a "bunny mill" type pet store in the Serramonte area of Daly City. This pet store is driven by profit, rather than concern for animals. Despite numerous pleas and educational efforts from Bay area shelter staff, rescue groups and animal lovers this store blatantly contributes to the pet overpopulation problem by selling underage and unaltered rabbits and not educating customers about proper care and supplies. It is the animals, like Irwin, who are consequently at risk for health problems throughout their lives. Irwin was still a baby when he was surrendered to San Francisco Animal Care and Control by someone who was tired of caring for him. In loving memory of Irwin and on behalf of those of us who on working on the front lines of animal rescue I am asking for you to consider helping TODAY in two ways: 1. Tell three people about the joys of living with companion rabbits. Tell them why they will save lives and money by adopting and not buying rabbits from pet stores. If they aren't in a position to adopt a rabbit, please refer them to our website to learn about other ways to help animals in need, including volunteering, activism and donating. 2. Please consider a donation to help us continue to rescue and care for these special little beings . Irwin's medical expenses alone will total close to $900. Little Irwin, may you run and dance in the meadows beyond the rainbow bridge and know that you were loved dearly and will be deeply missed. If you would like to donate to help Irwin, we would be extremely grateful. Hey! My name is Irwin. Many people have told me that I am one of the cutest bunnies that they have ever met! 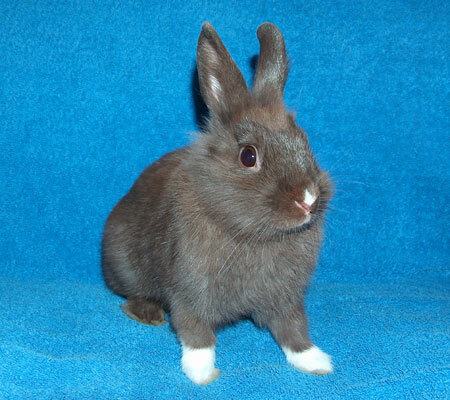 I am a small, lionhead boy, about 3-4 months old and will soon be neutered and the available for adoption. In addition to my ADORABLE white bunny socks and button nose, I am also a really nice rabbit. I'm happy, outgoing and a lot of fun. Because I am so small, I am fragile and would probably be a good choice for homes without young children who might accidentally injure me with their enthusiasm. As you can see, I am really a special rabbit with good looks and a wonderful personality. Please meet me soon!